George Graham reviews Snarky Puppy's "Family Dinner Volume Two"
While most contemporary music albums tend to follow a familiar formula of the band going into the studio to record, with occasional special guests, there have long been some more ambitious projects that tend to bring together diverse artists in sometimes interesting, and sometimes not-so-artistically successful combinations. Those collaborations can sometimes sound forced or overly commercial with the artists settling on the lowest common denominator for their point of convergence. But there have been some projects that freely and creatively mix genres and musical personalities in ways that work surprisingly well. Among such projects we have noted recently on this series are the Playing for Change albums whose music was created by artists around the world, recorded in field recordings in their own environments and combined in the studio. This week we have a fascinating project that is perhaps almost the opposite of the Playing for Change recordings, a bunch of very diverse musicians brought together for a week of rehearsals and composing and then recording live all together before an audience. It's the new album by the two-time Grammy Award winning fusion ensemble Snarky Puppy, called Family Dinner Volume Two. Now they are out with Family Dinner Volume Two, and they journeyed to New Orleans and again it's a fundraiser in this case for the Roots Music Foundation in the Crescent City. They brought in artists from all over the country and the world with appearances by Vasen from Sweden, Salif Keita from Mali, Peruvian vocalist Susana Baca, soul singer Chris Turner and interestingly, David Crosby or Crosby Stills and Hash fame. Band leader Michael League writes that it was the first time that they invited instrumental soloists to appear on one of their albums, and did some interesting pairings such as Appalachian-bred singer-songwriter Becca Stevens working with the Swedish group Vasen. And like the previous ambitious projects by Snarky Puppy, it was all recorded live, in this case in a studio built in a converted church with a small studio audience spread out in the choir loft and fairly close in to the many musicians playing. League also pointed out that because there were no individual dressing rooms in the old church, that forced musicians who had never met to be in close proximity and there was soon a lot of collaborating going on. They took six days to make the album, with what League describes as 13-hour days of rehearsal and arranging before the ultimate recording which was done with the audience. The result is an intriguing mix. There are the expected influences including African, South American, funk and a the singer-songwriter aspect. Most of the eight tracks are lengthy and go through a musical evolution during the course of their run. 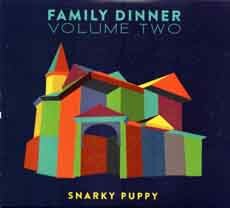 Family Dinner Volume Two by the eclectic jazz-rock fusion group Snarky Puppy is one of those ambitious projects putting combining a bunch of very disparate musicians. Each track essentially has a guest vocalist and a guest instrumentalist. The Snarky Puppy band as such remains in the musical background providing the accompaniment along with the interesting arrangements. It all works very well, and the format of the collaboration was distinctive, with the various diverse players, most of whom had never met, and some of whom had not heard of each other, getting together for 6 days in a former church and working out a program of music to be performed live in real time before a studio audience. Doing it that way is rather ambitious and not without risks. Making it a more rewarding project is that the CD comes with a well-produced DVD with video from the performances and interviews with the guest artists. One can see the unusual way the sessions were recorded, with everyone squeezed together in the relatively small former church, with the studio audience surrounding them, and everybody in the audience listening on headphones to eliminate the coloration that amplification in the studio would cause. So for a sound quality grade, I give the CD an “A.” As a recording engineer of a few decades experience, I know that recording the way this album was done is challenging, but the recorded sound is first rate, with a very good mix and a pleasing warm sound, and not too much volume compression to artificially jack up the loudness. And as an extra treat, the accompanying DVD is recorded in 5.1 surround sound. Sadly, recording and mix engineer Eric Hartman passed away suddenly shortly after the making of the album. With this and their last albums Snarky Puppy, led by Michael League has become one of the most interesting instrumental ensembles on the scene. Family Dinner Volume Two has much to enjoy on its menu.